xpert Instant Messenger for Enterprise, why expert It is a Smart & direct communicator, not only covers messages but also emails directly! When a new mail arrives, it will present you the email contents directly in the POP up window, then you can read, even write a mail just with it. You don't need to worry about delay or miss any mail. That is powered by OnlineNIC's unique technology - Mail On-the-Fly(TM). Intra Communicator allows you to stay in touch with other members of your organization or any of your partners you added to you contact list. 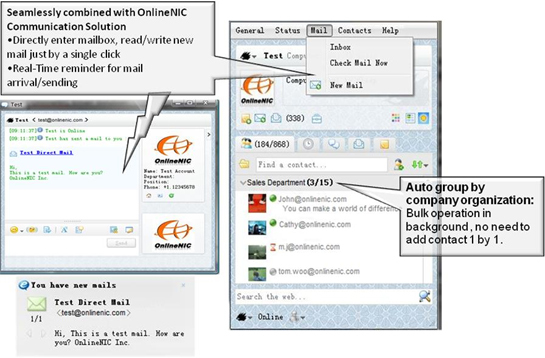 In addition, Intra Communicator can also support your MSN contacts, that means, you can use this tool to chat with your MSN friends. Actually Intra Communicator can connect with almost all Jabber based IMs, and trackable history logs are available. Organization/Group Contact list just needs to be maintained at the system back end. Users will experience an auto-update contact list. John is a new hire in your company, with Communicator, once his email account (Intra Communication Solution Based) is created, the Communicator account will be done synchronically, and John will see the contact list has been there after the 1st log on. Try to think the difference, especially when you're in a large company.